We’ve just introduced a new layer to our virtual races, allowing each participant to compete as a member of multiple groups, rather than just individually and/or as a member of only one team. 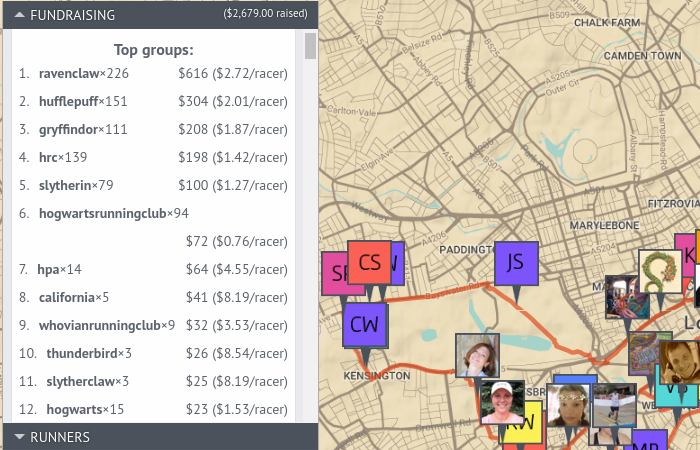 Groups can compete for most donations AND highest average donations per racer. The feature was introduced midrace and has not yet been announced — many people in the race don’t even yet know they’re part of this competition. It will be fun to see how it plays out in coming days as news of the leaderboard spreads. Click this link to the virtual group fundraising leaderboard for the HPA charity event. Here’s the background on how this group competition works, and why this matters. We’re used to hosting races in a virtual space where traditional limitations can be ignored — if you want your team of 20 people living in 20 different places to run down the Champs Elysee tomorrow, we can do it! Because of this special anti-gravity magic, we’ve often wondered whether we could take competition a step beyond the real world concepts of ‘individuals’ and ‘teams’ to some new dimension. This out-of-the-box thinking led to the new Group Leaderboads feature. The feature pulls from the groups that racers join or create when filling out in their own bios. A racer can compete as a member of larger and more loosely defined cohorts — say NikeFans or Tarheels or liberals or ToeRunners or Ravenclaws. Or as a member of all fivegroups at once! If they wanted to, racers could compare how much fundraising can be attributed to UNC fans versus Duke fans, or residents of Boston versus New York, or dog lovers versus cat lovers. If you’re a web geek, this ‘groups not teams’ concept may sound familiar. Web philosophers have often talked about folksonomies — classification systems that avoid the rigidity of top-down, one-slot-only taxonomies. In essence, the databases behind the web let people build a grocery store in which the same item can be found in multiple aisles. As far as we know, our group leaderboards are the first example of this concept in a competitive context.